One of the drum and bass scene’s most respected record labels and a firm Zane Lowe favourite, AudioPorn, snapped up James Marvel in 2013 and signed him exclusively thanks to his fresh take on the genre. Having remixed both Dub FX and Xilent to huge effect recently, causing riots on 170+ bpm dancefloors across the globe, now it’s James Marvel’s opportunity to destroy dancefloors with his own original music. 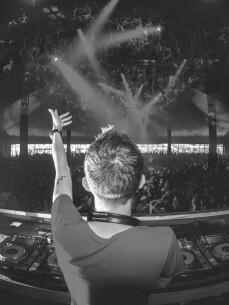 James Marvel pushes further after the success of the single Way Of The Warrior, with 3 nominations in 2015’s Drum & Bass Arena Awards in the categories Best Newcomer Producer, Best Track for Way Of The Warior and Best Remix for his remix of Dub FX’s Back To Basics in collaboration with Hypoxia. Taking the coveted #1 position on Beatport’s Drum & Bass chart within the first week of its release, ‘Way Of The Warrior’ is not only drum and bass at its finest and most energetic, it’s also drum & bass at its most experimental. Fuelled with MC Mota’s off-key spitfire raps and James Marvel’s uncompromising, head-splitting bass. Receiving radio support on BBC 1 by Annie Nightingale, Kiss FM by both Brookes Brothers and Joe Ford, the single has gained DJ support from heavy hitters such as Loadstar, Nymfo, and John B.
James Marvel’s musical background benefits from broad musical and cultural influences spanning back to his early childhood when he learned guitar and saxophone, and later studied piano at the Ghent & Brussels Conservatories. Before making the switch to electronic music, James Marvel aka Jens Blaute, played keyboard with several bands in Belgium and Holland. Taking influence from drum and bass producers such as Ed Rush & Optical and Bad Company, Marvel launched his production career under the moniker James Marvel in 2011 and quickly caught the attention of tastemakers in the scene, gaining support from labels and promotional channels such as Ammunition Recordings, Titan Recordings, Liquicity, Neurofunkgrid and Skanknbass before the release of his AudioPorn debut ‘I Am The Robot’ EP in 2013.